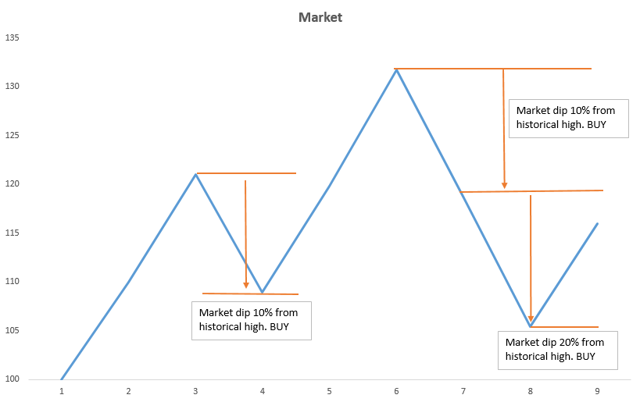 Buy The Dip (BTD) is an age old market timing strategy that is simple to grasp and easy to sell. Markets do not correct as frequent as people think. You can buy the dip but don't wait for the dip. Buy The Dip (BTD) is an age old market timing strategy that is simple to grasp and easy to sell. You see both experts and common people strongly advocating all to load up on equities whenever the market experience a significant fall. For instance, some may buy when the market falls every 5%, others 10% or 20%. While exact executions can vary, the underlying premise is the same. And that is the market will eventually recover and go up over the long run. It is a straightforward and popular strategy. Buying something you want that is currently cheaper than what it once was definitely has its appeal. But I do need to add a caveat here. How much cheaper or is it even cheaper hinges on how far back you are looking. I know some of you who are more investing savvy maybe thinking along the lines of a value strategy where you load up on specific bargain counters that are deeply oversold against your valuations during panic selloffs. But no, this is not what I am referring to here. The dips I am talking about is with reference against the absolute price level, and on broad based instruments like an index ETF. So when I say buy the S&P 500 when it dipped 10%. I mean literally a drop in its price by 10%. As an example, if S&P 500 trades at a high of 2500, you will start picking it up when it drops to 2250. It does not matter whether the drop is due to deteriorating fundamentals or economic conditions resulting in lower valuations. Does market always go up in the long run? First of all, how long is your long run, what market are you looking at, and when did you enter the market? For some 10 years is long, while others are looking at 20 years or even 30 years and more. Depending on the time frame you are looking at, which market you are vested in, and when you enter the market, it may not necessarily always be headed up. But in general, according to history, the longer you hold, the more likely this thesis pan out. There are always outliers though. As an example, Japan has a draw down period measured in decades since its peak in 1989. And I can assure you it definitely feels anything but good to know that you made virtually nothing on your hard earned money after almost 30 years. You are looking to invest $100,000 in the stock markets for the long term. But you are undecided about whether you should put it all in right now, implement a Dollar Cost Averaging (DCA) approach, or to divide it up and invest the money only when the market dips. For the latter, lets take it that you intend to invest an equal amount for every 10% the market retrace from its previous high. Lets assume you are able to buy at the close of the market and transactions costs are negligible. Sounds simple? But there is a problem. Because unless you can see into the future, you have no idea how many 10% retracements there are going to be. To simplify matters, lets assume the best case, albeit unrealistic, scenario where you are somehow able to get that number. And lets call this the BTD strategy. Lets get ready to see BTD in action. I will test BTD out on the US, Hong Kong and Japan stock markets from 1987 to 2018. Again, I will use the stock market price indices as the proxies for market performance. So dividends are excluded. And lets also assume transaction costs are negligible and idle cash sitting around earns you an interest of 1.5% per year compounded daily. US is one of the strongest equity market. At the end of 2018, BTD yielded an annualized return of 4.2% or about $370,000 against 7.6% and $1,000,000 for lump sum method. 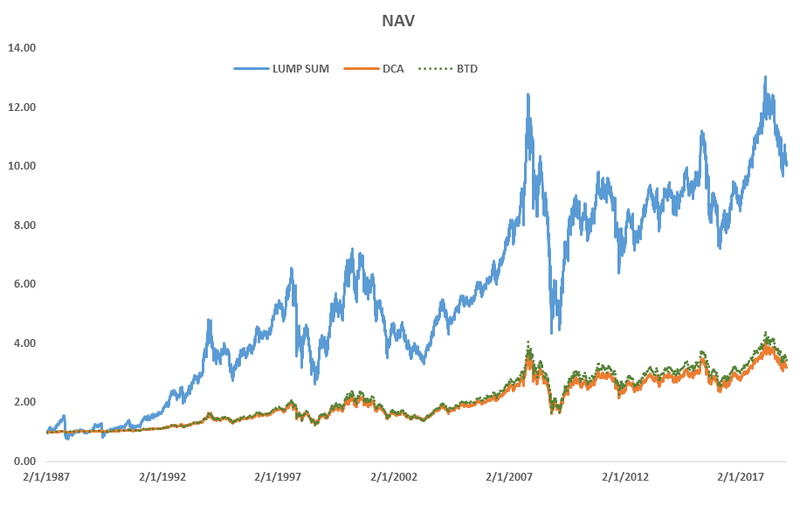 While it under performs the lump sum approach, BTD managed to edge out DCA marginally. I don’t think anyone is surprised by the results given how strong US equities have performed. But what if I started in 2000 right before the internet bubble burst? Between 2000 and 2018, the US S&P 500 only delivered 2.9% annualized returns thanks to the dot com crash in 2000 and the subprime crisis that followed in 2008. During each of this bear markets, S&P 500 lost about 50% from the highs. This presents the most opportune time for BTD strategies. 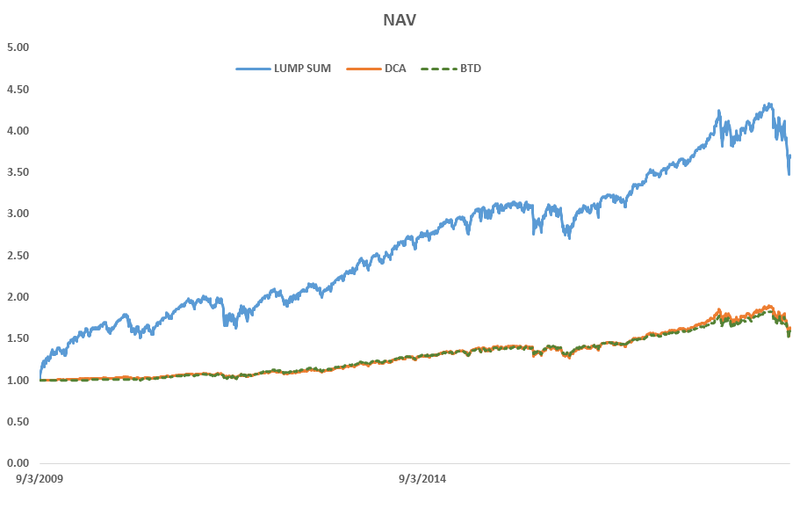 And indeed, BTD emerge as the top performer with 4.1% annualized return while DCA takes the second place with 3.6% annualized returns. Now lets do one more tweak and start after the market bottomed out in 2009 and see how things turn out. 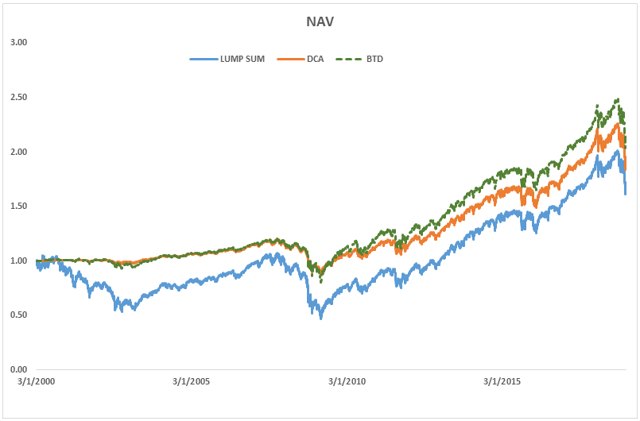 Post 2009, US experiences one of its strongest and longest bull run in history, delivering a stellar 14.3% annualized return. Meanwhile, BTD trailed far behind with just 4.9%. In this scenario, the opportunity cost of waiting for the dip is anything but trivial. There are not that many 10% dips during this unprecedented bull run. 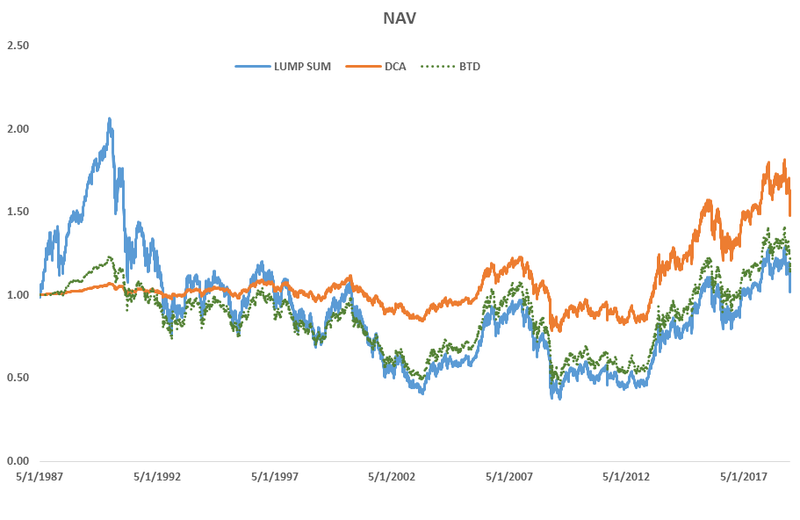 Two such dips happened during the initial volatile recovery period from 2009-2011 . Thereafter, the next 10% dip did not come till 2015. This experience can be liken to passing up opportunities to buy water because of the price, only to end up walking into a vast desert with no water in sight and no chance of turning back. Now, lets look at the Hong Kong stock market from 1987-2018. Despite HK being more volatile than the US market and having more dip buying opportunities, the end results are not that different. BTD lost to a lump sum approach by a wide margin while outperforming DCA slightly. But again if I start BTD right after the market peaked in 2007 then I will definitely be better off. It is unnecessary to show any charts and tables here as the Hang Seng 50 is still clearly below its 2007 peak at the end of 2018. Now lets move on to a more exceptional market – Japan. And why do I say its exceptional? At its height in 1989, Nikkei 225 hovers near a level of 39,000. And almost 3 decades later at the end of 2018, Nikkei is just half of that. Wait a minute, didn’t some experts say that equities can only rise over the long term? Or is 30 years still too short? I don’t know where these experts hail from, but humans have a penchant for turning generalized observations into one-sided “facts”. And in this case, an improbable event is conveniently brushed aside as an impossible one. So how will BTD fare this time from 1987 – 2018? 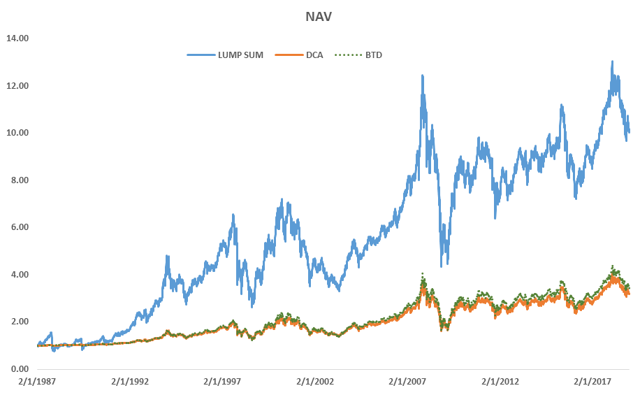 It did only a little better than the lump sum approach and worse off than DCA because Nikkei 225 first doubled from 1987 to 1989 before the long journey south begins. So the price can dip a steep 50% before it goes back to the level at the start of 1987. So Should We Buy The Dip? BTD’s performance, like DCA, is highly contingent on how the market moves. But for most people with a long term view and who do not have the time or expertise to actively manage their investments, I would go for a yes. If you have already set aside the money to buy into the markets, and a significant price drop comes along, of course you buy. However, a more pertinent question is not whether we should buy the dip, but rather whether we should put our money on hold and wait for the dip? As evident from history, significant market corrections do not come by easily. From 1987 – 2018, the BTD strategy used bought into only 19 dips on S&P 500, 35 on Hang Seng 50 and 11 on Nikkei 225. 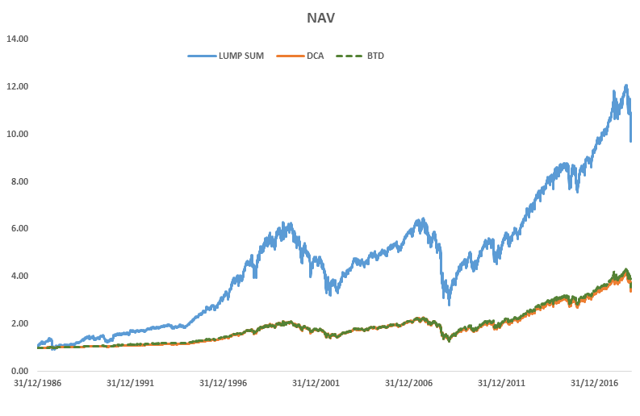 In the long run, BTD trails behind a lump sum approach for the markets that trended up. No one can predict when the next correction or bear market is going to come. Not even legendary traders like George Soros. He has a bearish view on the stock markets since 2014 and here we are in 2019. Where’s the bear? The market has went on a super long euphoric bull since 2009. And S&P 500 rose from a low of 676 to 2506 at the end of 2018 or 370%. The price of waiting may be higher than you think. What if we encounter a “Japan”? Well, we don’t know if its a “Japan” until 30 years later. Meanwhile, your best protection – diversify. Disclaimer: Any views or opinions represented in are personal and belong solely to me. It does not represent any other people, institutions or organizations that may or may not be associated with in professional or personal capacity. The views or opinions are not intended to offend or malign any religion, ethnic group, club, organization, country, company or individuals. The content is provided for informational purposes only. It is not intended to be, nor shall it be construed, as an offer, or a solicitation of an offer, to buy or sell an interest in any fund or security. I make no representations as to accuracy, reliability, completeness, suitability or validity of any information.